I am currently serving as the Program Director for our newly formed Educational Technology unit after our two year pilot program. I’m also co-director of the national eXtension Educational Technology Learning Network. I’m especially interested social media and mobile learning because I love social media and am simply fascinated by the explosion of mobile learning technologies that are rapidly changing how people not just have access to education, but are also changing the very ways they learn! I am also interested in how these technologies can be successfully researched so that we can gain insight into how to best utilize them in our field. Digital scholarship and how we define quality, scholarly work that includes digital media is a barrier to tech adoption in our field that we must learn to overcome. I also believe in collaboration. Because we’re stronger together than we are apart. Like all Extension professionals, I have worn many hats. Program Director, Ed Tech Specialist, Educator, Program Coordinator to name a few. 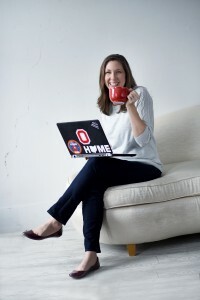 I’m also a mom and wife and enjoy cooking, running, traveling, cheering on the Buckeyes in The Shoe with my husband, a good glass of vino, and of course helping with homework or shuttling my kids to wherever they need to be on any given night! Oh and coffee. I really like coffee.